Silk Road(s) is a term introduced in 1877 by German geographer Ferdinand von Richtofen to describe the trade routes between the Mediterranean basin and the Far East. Silk was one of the main commodities exchanged along these routes, but not the only one; spices (mainly pepper), dye (indigo), furs came to the west through them. Manufactured goods (small metal objects and glass wares) were shipped eastwards and the imbalance was covered with payments in gold: Roman, Byzantine and Venetian gold coins have been found in many locations in Central and Eastern Asia. In 1259 Niccolò and Maffeo Polo, two Venetian merchants living in Constantinople decided to leave that city which was on the verge of being recaptured by the Byzantines. They relocated in the Crimea, where they had trading connections. In the following years they moved to Bukhara in Central Asia; their aim was to reach Tabriz, at the time a flourishing city of the Mongol Persian Ilkhanate; wars between the various khanates into which the Mongol Empire was split, forced the Polos to stay in Bukhara for three years during which time they became acquainted with local languages and social behaviour. In 1264 they were invited to join a caravan going from Persia to the court of Kubilai Khan: he was the grandson of Genghis Khan and he claimed to be the supreme leader of the Mongols. In 1266 when the Polos reached the court of Kubilai Khan, this had just been relocated eastwards, outside the Mongolian homeland, into northern China. The new capital was called Dadu by the Mongols and Khanbalik by the Turks; later it was named Peking which means Capital of the North (and in recent years renamed Beijing). The Polos returned to Venice in 1269 with a letter from Kubilai Khan to the pope, which they delivered only in 1271 when, after the longest conclave in history, Pope Gregory X was elected. In his letter Kubilai Khan welcomed the arrival of Christian missionaries in his immense empire; the Mongols had managed to defeat Chinese and Muslims, but they were gradually being conquered by the superior civilizations of their subjects, including their elaborate religions; perhaps Kubilai Khan was interested in assessing the possible political advantages of introducing the Christian faith to his empire. His appeal was let down by the pope who sent only two Dominican monks with the Polos when they started their second journey to China. In 1274 the Polos arrived at Khanbalik without the monks who had preferred to cut short that dangerous journey, but with Marco, Niccolò's son. They stayed in China for seventeen years and they finally returned to Venice in 1295. Marco Polo's account of his travels became a bestseller in Europe at a time when books were extremely expensive and were usually dealing with religious topics. 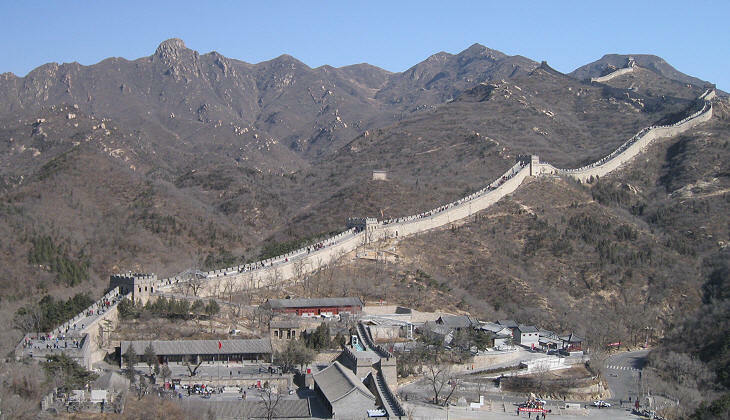 Marco Polo did not mention the Great Wall in his book; this because the current Great Wall was built at a later stage and with the objective of preventing a second Mongol invasion. It would not have made sense for Kubilai Khan, who ruled over both Mongolia and China, to maintain a similar defensive structure. The Mongol rule over China (Yuan Dynasty) lasted until 1368; it was a golden period for trade along the land Silk Road; it came to an end when the Ming dynasty replaced the Yuan rulers who retreated to Mongolia. Continuous conflicts between the two dynasties became an obstacle to trade by land, thus increasing the use of the long maritime route from southern China to India and from there to the Persian Gulf and to the Red Sea. 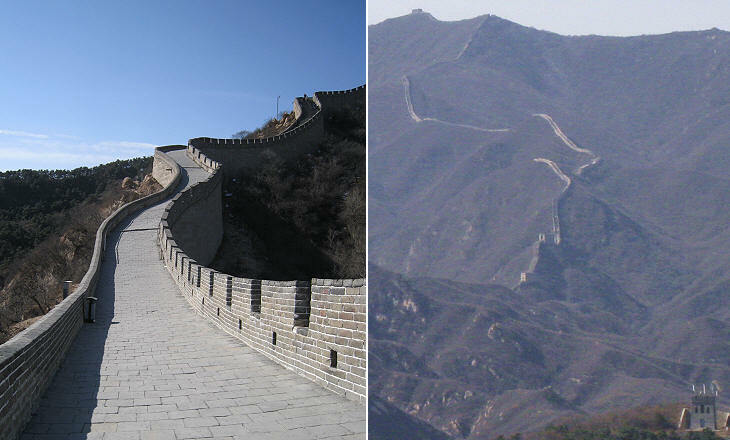 The Ming built the current Great Wall which was preceded in history by other long lines of fortifications along the northern border of China; while the Ming Wall was mainly made of bricks, its earlier versions used a combination of raw materials kept together by dried mud; a technique which can still be observed in the walls of Khiva. The city of Xian and its nearby parent city of Xianyang were at the end of trading routes with the West during the IIIrd century BC (Xianyang - Qin Dynasty) and between the VIIth and the IXth centuries AD (Xian - Tang Dynasty). The image used as background for this page shows a detail of the Great Mosque of Xian.